There is a common perception that utilizing inventory-management component within commodity trading and risk management (CTRM) systems is optional. It’s considered a way to make an accountant’s life easier and often relegated to a future stage of implementation if it is considered at all. There are a few reasons for this line of thinking. Accounting is typically viewed as a cost-center, and their needs are assigned a lower priority. Commercial functions are important and critical to daily operations. 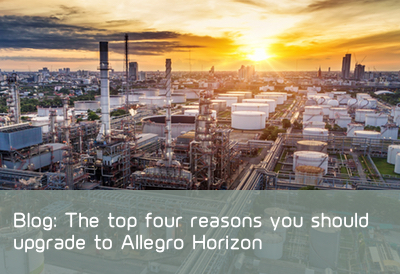 It is a logical decision to invest in tools that can provide as much automation to support their tasks as possible. If you follow that line of thinking, it is easy to draw the conclusion that inventory management just isn’t the best way to spend money. It is an accounting responsibility, and that group does not contribute to the bottom line. In other cases, front and mid-office don’t want to invest the time necessary to support inventory management. In order to use your CTRM effectively, trades and logistics details have to be captured in a timely and accurate manner. Locations, modes, and costs of transporting also have to be configured and properly utilized to get worthwhile information. When we subscribe to the previous points of view, we are overlooking the ways that inventory management and valuation can contribute to the health and well-being of the entire organization. To be clear, inventory is critical for accountants. Inventory is an important component of the financial statements. Inventory-management tools can report volumes held at various locations and calculate their related valuation according to your chosen method. Your system generated inventory provides a centralized record and eliminates inconsistencies in methodology and timing differences that can result when you track transactions in a system and value inventory in a spreadsheet. When your CTRM system supports the reconciliation of inventory volumes in your system to third-party documentation, accountants can easily identify discrepancies that require investigation. If issues are not handled by month end, they can be carried forward and accrued until they are resolved. Bridging the gap between real-world and book inventory volumes offers a powerful advantage. It provides an audit trail for write-offs and adjustments that need to be made and ensures the integrity of the assets on your books, as well as the integrity of your financial statements. The same standards of configuration, trade capture and logistics that would be required to calculate your inventory valuation create the conditions required to make inventory levels available to all personnel in near real time. The commercial team must know how much product is on hand and the related locations in order to make sound day-to-day business decisions. Forecasting and planning teams can improve decisions about what product to buy in the future if they have more accurate foundational data. You need the correct amount of product at the right time and in the right location to take advantage of opportunities before they become stale, and to serve your markets. Your accountants are freed to perform analysis rather than crunch numbers. Speeding up your accountant’s month end duties helps you close the month faster and with a reduced chance of errors and omissions. Everyone wants to close on the first or second work day of the month, which isn’t typically possible when inventory is managed manually in spreadsheets. Your organization is better poised for growth. When you enter new markets, you don’t have to create a new spreadsheet. Your new activity is seamlessly folded into your inventory results with minimal configuration. Everyone and every business process does benefit from more accuracy, consistency, and visibility. Your one source of inventory should be trustworthy—with no quantity variations among different departments. Where value is not consistent between groups, it should be for sound business reasons rather than human error or timing differences. 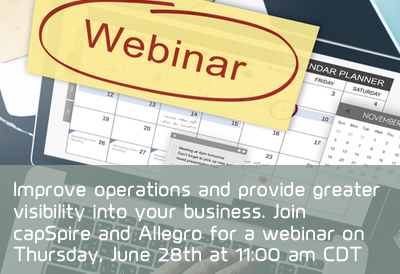 To learn more about how inventory-management tools within CTRM systems—specifically in Allegro—can improve your business operations, view our on-demand webinar, Unleash the Power of Allegro’s Inventory Management, co-hosted by capSpire and Allegro. capSpire provides the unique combination of industry knowledge and business expertise required to deliver impactful business solutions. Trusted by some of the world’s leading companies, capSpire’s team of industry experts and senior advisors empowers its clients with the business strategies and solutions required to effectively streamline business processes and attain maximum value from their supporting IT infrastructure. For more information, please visit www.capspire.com.